It takes a special player to rise to the occasion of performing in the big moments. Some players have the ability to do so, while others shrink in the spotlight. Not everyone is meant to be a winner. But some guys just have that special X-factor. And goaltender Dustin Tokarski is one of those guys. In every stop of his hockey career, Tokarski has won. In 2006, he won the Telus Cup, Canada’s midget hockey championship. He made 53 saves in the Memorial Cup final in 2008 to win it all for the WHL’s Spokane Chiefs. He struggled at times during the 2009 World Junior Hockey Championships, but he stood tall in the final with 39 saves when it mattered the most to help Team Canada win its fifth consecutive gold medal. As a pro, he backstopped the AHL’s Norfolk Admirals to a Calder Cup championship. Despite all these championships and the accolades that go with it, Tokarski couldn’t stick with the Tampa Bay Lightning. His numbers with Tampa are nothing to write home about with 7 game appearances and a 1-3-1 record and a save percentage below .900. His size didn’t do him any favours at 5’11” as Tampa showed a preference for big goalies having brought in Anders Lindback (who is now with Dallas), Ben Bishop and prospect Andrei Vasilevskiy and all three players range from 6’3″ – 6’7″. As the league has seen bigger goalies being drafted and having success in the NHL, Tokarski is an anomaly in a sense. While big names like John Tavares and Jordan Eberle dominated the 2009 World Juniors, Tokarski made sure he wasn’t about to be forgotten. However, the minor trade that brought Tokarski to Montreal back in February 2013 changed everything. Little did anyone know that a year later, it would be Tokarski stepping into the pressure packed Eastern Conference final to replace the injured Carey Price, not Peter Budaj. Even though the Habs lost in six games to the Rangers, Tokarski gave the team a chance and while it would have been next to impossible to completely fill Price’s shoes, Tokarski was outstanding and did everything he could. Even coach Michel Therrien, who can be stubborn when it comes to playing veteran players, knew that Tokarski was the team’s best chance. Training camp would be the true test for how Tokarski had progressed. While many had Budaj pencilled into the backup role citing his leadership and friendship with Price, it was Bergevin who pulled the trigger dealing Budaj to the Winnipeg Jets freeing up the backup spot for Tokarski. It was a gutsy move but the right one to make. When pressed into multiple games in a row or pressure packed situations in his time with Montreal, Budaj quite simple failed to step up to the plate. 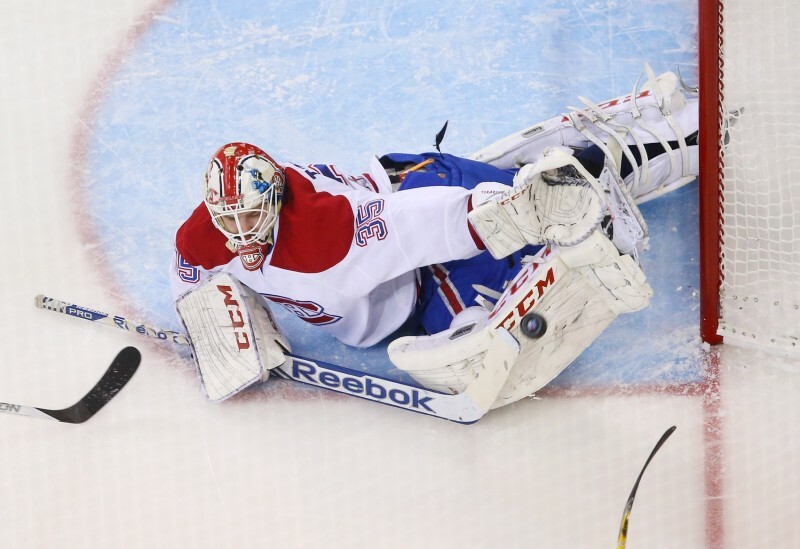 When Price went down in the 2013 playoffs against Ottawa, Budaj stepped in and Montreal lost that game 6-1 and were ousted from the playoffs. In 2014, Price was out for several games post Olympics so naturally Budaj got the call but struggled. It was where Tokarski would make a mark by playing against a very strong Anaheim Ducks team and helping the Habs beat them in a shootout. Having Tokarski makes Montreal better. He is younger, cheaper and better than Budaj so it was a no-brainer by Bergevin to make the trade. Tokarski absolutely robbed Martin St.Louis showcasing his athleticism and ability to make big saves. As a goaltender, Tokarski’s style is built upon athleticism, reflexes and instinct. He doesn’t fill up the net like the 6’3″ Price, so it makes his decision making and reflexes that much more important. Puckhandling is not a strong point for him but working with one of the best goalie coaches in Stephane Waite will surely address that. However, his athletic ability is very impressive as he manages to stretch out to make top notch saves. As a guy who has been No.1 for so long, he is being asked to take a back seat in Montreal. Price is a workhorse capable of playing 60-70 games a season and of the 10 games Montreal has played so far, Tokarski has started just two so far. While it is unknown to how Tokarski’s NHL career will pan out whether as a number one or as a backup, there is little to suggest Tokarski won’t walk away from his hockey career without his name on the Stanley Cup. He has won everywhere he has played and it makes no sense for him to stop. After all, all he does is win.